I know it's something the players on either tour aren't exactly thrilled with, but the short offseason sure is a good thing for the tennis fan! Tournaments for the new year kick off this week with events ranging in locales from Australia to India in preparation for the year's first Major, the Australian Open. Big names are all out there ready to do battle: among them, Maria Sharapova, Andy Murray, Serena Williams and David Ferrer. There are others, of course, but these four are the creme de la creme. And why shouldn't they be considered that? You can't knock what they accomplished in 2012: Ferrer led the tour in titles, Murray captured his first Slam, Sharapova completed the career Slam and Serena's '12 needs no explanation. It would be hard to discount their potential for the season ahead, so I won't do that here! Rather, I'm just glad to be able to catch them and their peers back in action. It's been too long. That latest news about Serena being recognized as WTA Player of the Year should lead to greater accolades, in my opinion. Like her being named athlete of the year—across all sports. Who really had a bigger year? LeBron James won Olympic Gold, his first NBA Championship, and was regular-season and finals MVP. Not to deny James' obvious talent, but you can't discount his teammates helping with those achievements. And that's something that has to be taken into account for other stars in team sports, such as Eli Manning or Miguel Cabrera. If you were to look at performers in individual sports outside the tennis world, you would probably have to take a hard glance at Rory McIlroy (who actually isn't without his own tennis ties). A Major title, plus a few other titles along the way is definitely solid. Nice, but that season by Serena … wow. 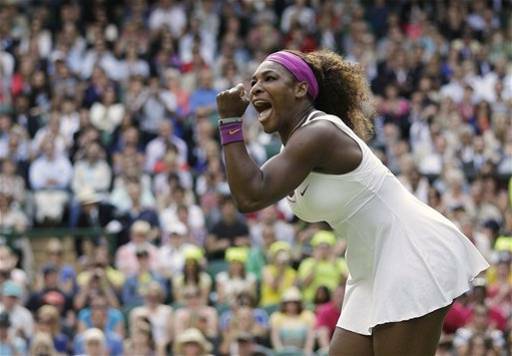 She captured the four biggest tournaments of the year's second half and did so in such convincing fashion. Nobody in any sport displayed such dominance, especially against opponents considered their toughest challengers. So AP, SI (Sports Illustrated) and any other letter-like organizations, please recognize what we were witness to in '12 and name her athlete of the year. TTA? is doing it!